Simply, the most unique event you have ever been a part of! Raft into the private Discovery Park, eat, drink, canoe, fish, while listening to the best music So. Oregon has to offer! All bands perform on a large floating stage. 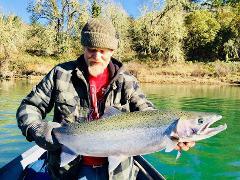 Three days and two nights on the "Wild & Scenic Rogue River". Top of the line camp gear is provided as well as healthy and hearty meals. 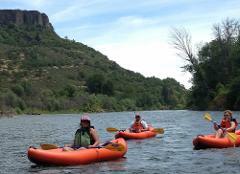 Guests have the choice to ride in the raft with the guide or captain their own inflatable kayak. Approximately 8 hours on the water. Includes professional guide and all necessary gear and tackle. Trips are ran from comfortable drift boats. THE COST IS PER BOAT. Each boat can hold up to two fishermen and a guide. Approximately 3 hours on the water. Includes professional guide. Trips are ran from comfortable drift boats. THE COST IS PER BOAT. Each boat can hold up to two passengers and a guide. 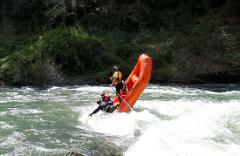 Four days and three nights on the "Wild & Scenic Rogue River". Top of the line camp gear is provided as well as healthy and hearty meals. The first two nights are camping along the river with a third night spent at Paradise Lodge. New skills will include: whitewater navigation, boat-rigging, basic rescue techniques, camp skills, food prep & equipment care.